If you have a question that isn’t listed, please drop us and email. We follow the weather forecast closely leading up to the event, If the weather isn’t clear enough for a safe lantern release, the event will be postponed to a later date. We will send out emails, tweets, and Facebook event page notifications if an event needs to be rescheduled. What are the legalities of releasing lanterns? We work with both state and local officials, fire marshals, and have an ambulance on site if needed to ensure our event is executed safely and legally. We have received permits to light and release the lanterns in designated locations. Our Water Lantern events are already on the water so there is no fire hazard from releasing the lanterns. No, bringing your own lanterns are not permitted! Our lanterns are used for their eco friendly material and for their burn time for safety and collection. 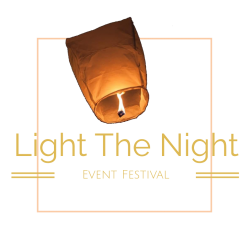 If you would like to purchase extra lanterns, you can pre-purchase them online when buying your ticket and they will also be sold at our merchandise tent at the event. No, all ages are welcome! For safety and legal reason, we require parents to keep up with kids while attending the event at all times. Please leave all footballs, soccer balls, etc, at home. We will have games and a bounce house for kids and adults for entertainment. Children under 13 are not permitted to light their own lanterns so you will need to light your lantern for them to release. We open the venue early afternoon for participants to enjoy a relaxing day full of music and entertainment. For an exact time, check your city’s event or Facebook page to see when gates open! Launch times vary by time of year and location, and after sunset. What time are lanterns released? Launch time varies by the time of year, the location, and usually 30 minutes after sunset. Is there parking and does it cost? This is dependent upon the venue, but likely yes, so please bring cash. All event information will be listed on the event locations page. No, outside food or drinks are not permitted. We will have plenty of food vendors, and bottles of water can be purchased at our merchandise tent. If you have a specific dietary concern, please contact us. Adult tickets include a wristband for entry, a lantern, and a small gift bag which includes a marker, lighter, and a box of sparklers. Kid’s Passes (for children 4-12 years old) will receive a small gift, but no lantern. Can I earn free tickets? Yes! The easiest way to earn free tickets is to send us details for venue locations willing to hold our events. Also share our events with your friends, and family. For the safety of pets and all participants, please leave your fur baby at home. Service animals are allowed, but please bring required paperwork of proof. All lost items are taken to our check in tent. If you’ve already left the venue, you can call or email for help finding any missing objects! How do I get Light The Night to come to my city or state? First check to see if Lantern Releases or Fireworks Displays are allowed, then call or email us. If you know the perfect venue to hold the event even better, send us their details and we will contact them. We’re always interested in partnering with companies and individuals. If you would like to be considered as a performer, please send us a sample of your music. If you would like to set up as a Vendor, please send us an email with details, such as if you will set up as a food vendor, merchandise booth, etc. We welcome sponsors, and it’s a great way to get your company, brand, etc more publicity, and contribute to family events, if you would like to become a sponsor please give us a call or send an email. Are bags or backpacks allowed into the event? We only allow purses, and diaper bags (when bringing a baby) into our events for safety reasons. We suggest you lock items in your vehicle’s trunk out of plain view. Light The Night is a for-profit business that believes in giving back, so we donate a portion of our proceeds to our many charity partners. If you would like a charity to be considered, send us an email with their information. Do your events have security? Yes! We staff security for all our events.